China's first indigenous purely electric supermini car hit the market on Monday as part of a government-sponsored project to encourage the use of energy-saving vehicles. Roewe E50 buyers in Shanghai could save around 100,000 yuan ($16,000), thanks to government subsidies and an upcoming local policy waiving license plate fees, according to company sources. 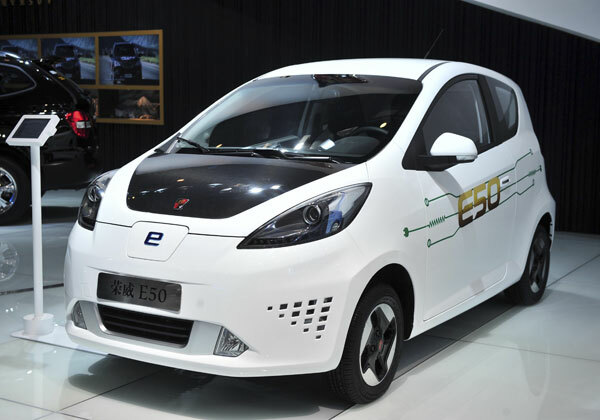 The E50, a purely electric vehicle, is the result of three years' research and development by Shanghai Automotive Industry Corp, said Shen Ling, public relations manager of the company's new energy department. The car applies advanced energy-saving and safety technologies to ensure zero emissions, she said. Although the new model officially retails at 220,000-240,000 yuan, buyers may enjoy steep discounts as the government and automakers strive to promote new-energy vehicles. Under a central government notice, a rebate of up to 60,000 yuan is offered on the purchase price to buyers of battery-powered cars, and the Shanghai municipal government is offering a subsidy of up to 40,000 yuan. A move which could give the sector a further shot in the arm is a policy due to be unveiled by the Shanghai authorities offering free license plates to owners of electric vehicles. According to Shen, the decision, which is subject to the approval of the National Development and Reform Commission, is likely to be implemented "very soon". Other than government incentives, auto manufacturers are seeking to drum up buyers' interest with value-added services. Meanwhile, SAIC is finalizing plans to offer discounts on group purchases by businesses, she added. Shen said the company has set no sales targets for the new model. But SAIC chief engineer Ling Tianjun said in August that it expects to sell 1,000 vehicles next year. The launch of the car on the retail market will be a step forward for new-energy vehicles in China, as the majority are currently owned by government bodies or used for public transportation. The average energy conversion rate of electric vehicles is 46 percent higher than conventional cars, and they have the potential to reduce carbon dioxide emissions by up to 68 percent, said Raymond Tsang, a partner at Bain and Company. Apart from purely battery-powered electric vehicles, hybrid cars, which run on a combination of batteries and conventional engines, are also popular as they are easier to operate, he said. China's strategy to develop new energy cars has gained ground on many fronts, according to Wang Tianwei, policy director of the policy coordination department of Jiading Auto City in Shanghai. On the policy front, the development of the electric vehicle industry has been a priority of the Ministry of Science and Technology for more than a decade. On the regulatory front, the Ministry of Industry and Information Technology and the National Development and Reform Commission have issued at least 20 regulations over the past decade to regulate and promote the wider use of hybrid and electric vehicles. The target was to make the country a world leader in electric vehicles by putting 500,000 on the road by 2011. But Wang said the deadline has been extended to 2015 as a result of technological constraints and a lack of policy coordination. Battery performance remains the greatest threat to the credibility of electric vehicles in motorists' eyes. Wang said Chinese companies still lag far behind their competitors in the West in battery technology. A study conducted by the United Nations Department of Economic and Social Affairs said China holds just 1 percent of the total patent registrations for lithium ion batteries, while Japan owns 52 percent and the United States has 22 percent. The other common concern is a lack of recharging stations, he said. SAIC has set up 1,170 recharging stations in Shanghai, but most of those are in suburban areas. Tao Weishuo, a veteran motorist in Shanghai, said that despite all the incentives he was still reluctant to buy an electric vehicle. "The shortage of recharging stations in the city center would limit where I could drive. What's the point of owning a car if it fails to take me anywhere I want?" Twenty-one private enterprises from China will join the China Going Green Dialogues - part of the 2012 UN Conference on Sustainable Development, known as Rio+20 - in June, in Rio de Janeiro, Brazil. Heilongjiang Forest Ecological Tourism Festival, an event aiming to promote healthy and environmentally friendly tourism, will be held in Yichun, Heilongjiang province, on July 13. World Environment Day is an annual event that is aimed at being the biggest and most widely celebrated global day for positive environmental action. The theme this year is Forests: Nature At Your Service.